em-pact's mission is to empower + support socially-conscious businesses to make an impact, through events, marketing, + communications services. 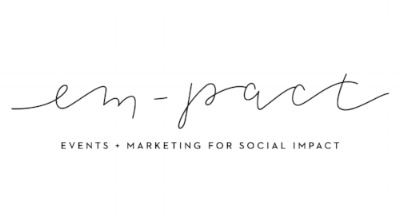 Our mission at em-pact is to empower + support socially-conscious businesses to make an impact, through communications, marketing, and events services. We believe in working together for a better world, and holding ourselves to the highest of standards. We're committed to flexibility, reliability, responsiveness, and respect for all. We love working with purpose-driven organizations. Whether you're a nonprofit / NGO, local small business, B-Corp, social enterprise, hybrid, ethical brand, CSR department, or a for-profit giving back, we can work with you to maximize your reach, engagement, and ultimately, social impact. Reach out to us - we'd love to chat with you! Henah Parikh is the Founder of em-pact. After completing a Master's in Social Entrepreneurship, and working for a variety of nonprofits in events + communications capacities, Henah founded em-pact with the belief that she could best serve others through supporting organizations with her particular skill sets. The causes she most deeply cares about are empowering girls & women globally, human rights, and sustainably eradicating poverty. In addition to her work with em-pact, Henah is a Community Manager + Staff Writer for The Good Trade, Steering Committee member of Women Advancing Microfinance (NY Chapter), & GenR member with the IRC. She also received her dual Bachelor's in Psychology + Communication from Rutgers University (go Scarlet Knights!). When Henah's not working, she can be found snuggling with her 2 kitties (Cali & Simba), eating her way around Jersey City, or traveling. Say hello!